For years I had heard about how awesome Benefit Erase Paste and Powderflage were, but not until recently have been able to see for myself just how awesome they truly are. If any of you are challenged with under eye darkness, you know how difficult it can be to find a concealer that gives opaque coverage, without it looking heavy or caky. Well, look no further than Erase Paste. This concentrated, creamy concealer brightens and camouflages in one easy step. 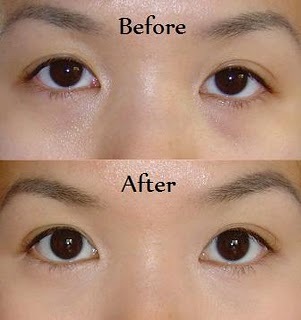 It targets dark circles, discoloration and imperfections. Its nice creamy texture is easy to blend and gives skin a natural healthy look. It comes in three shades with brightening melon undertones to suit every complexion. In addition, it comes with a fully illustrated, step-by-step lesson and mini-spatula for easy application. *Run your fingertips under warm water to heat them up before blending erase paste. *Less is more. You only need to use a little for it to be effective. *Can also be used for covering broken capillaries, blemishes, any discoloration. *Apply Powderflage over Erase Paste to help it not only conceal better, but also last longer. 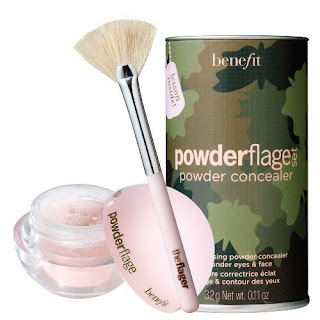 Powderflage light-diffusing powder concealer for under eyes and face. This virtually weightless powder concealer camouflages fine lines and dark circles. It's fast, easy, lite and breezy. It can be worn alone or apply over concealer to help it last longer. Comes with a "flager" brush, which applies exactly the right amount of silky pink powder. *Dip the flager brush into powderflage & tap off any excess powder. Lightly brush under your eyes until desired effect is achieved. *For light, bright concealing use alone. *For extreme concealing apply over cream concealer. *Camouflage & diffuse lines. Dip the flager brush into powderflage & tap off any excess. Sweep brush in upward strokes across the laugh lines on either side of your mouth. *Use the same technique on frown lines on your forehead. Redbook magazine's 2008 MVP (Most Valuable Product) Award. 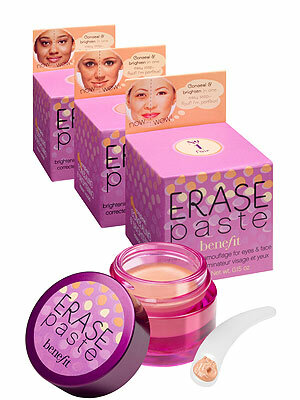 Erase Paste and Powderflage can be found at Sephora, or any department store where Benefit products are sold.